The border crossing from Buenos Aires to Uruguay was simple. We took the ferry. We cleared immigration out of Argentina and into Uruguay together at the dock and then Brian rode on and cleared Argentina customs with the bike. At the other end we rode off, stopped for about 15 minutes while the officials filled out the carnet and we were on the road. 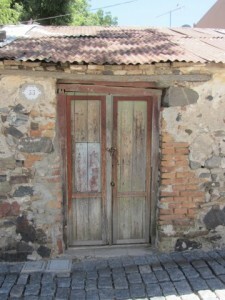 We spent three days at a great hostel on a farm about 50 ks out of the historic town of Colonia. El Galope was a real find. Miguel and Monica run a very friendly, laid back establishment. They cook up a storm at night, have a very tasty local wine for sale and encourage their guests to relax and enjoy. 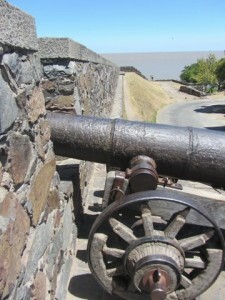 During our stay we spent one day at Colonia del Sacramento, the smugglers town established in the 17th century. The cobbled streets show the ingenuity of the Spanish and Portuguese who lived here. Drains to take away the rain and fortifications to hold back any adversary are reminders of days gone by. 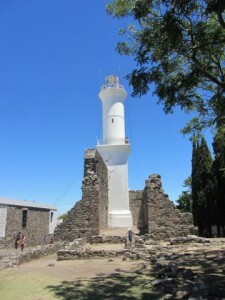 The houses, church, lighthouse and little laneways are now inhabited by tourists, many of them driving little golf carts! 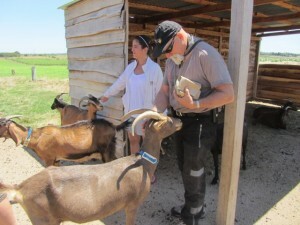 From El Galope we visited Victoria’s goat farm and taste delicious cheeses made on the premises. And we took a ride down to the river for a swim. The River Plate is so wide we knew Argentina was on the other side – we just couldn’t see it. Next stop Montevideo. 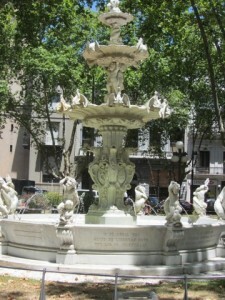 The old city is filled with quiet plazas, interesting buildings and street markets. When it comes time for lunch you head down to the old port where there are heaps of eateries at Mercado del Puerto. An asado was the order of the day but it wasn’t as good as the one Monica cooked for us at El Galope! 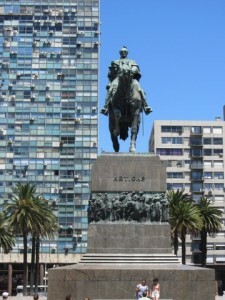 Jose Artigas is buried in the centre of the city and a huge statue to him stands watch over his mausoleum. It was closed – more’s the pity! When it comes down to it Uruguay is about beaches. 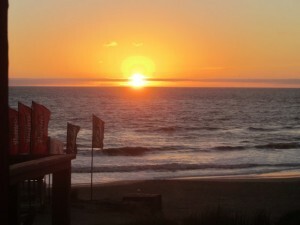 There are beaches along the river and you hit the Atlantic coast just north of Montevideo. We love the beach and walking along the sand and jumping over the waves was a pleasant way to spend several days. 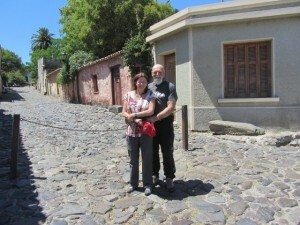 We visited Piriapolis, the town that was the playground for the rich and famous of Argentina in the 1930s. Today it is a family holiday destination – not too expensive and good beaches and surf. 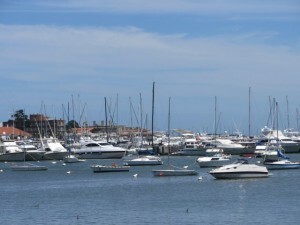 Punte del Este is where the rich and famous head now. It is ridiculously expensive and a like the Gold Coast on steroids. 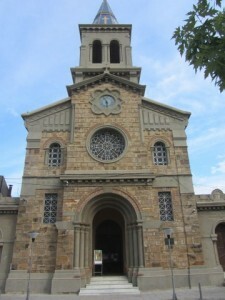 The people weren’t very friendly, something we hadn’t found anywhere else in Uruguay. 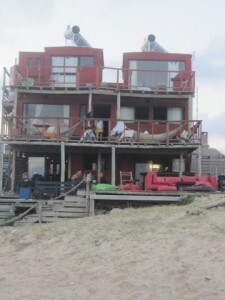 Our dream destination was Punta del Diablo. Its dirt streets, ramshackle wooden restaurants and bars along the beach front were a haven. The ‘no shirt, no shoes, no service’ rule just hasn’t been invented here. Thongs and a T.Shirt with your boardies is just about overdressed! We stayed at El Diablo Tranquilo Playa Suites, right on the beach. We walked out of the bar onto the sand. We had to drag ourselves away. The road was beckoning. We headed inland, on our way back to Argentina. We spent a night at Tacuarembo, the home of Carlos Gardel, the man who invented the Tango. An afternoon at the thermal springs at Dayman and it was time to cross over into Argentina and head towards the legendary Iguazu Falls. We were sad to leave Uruguay. 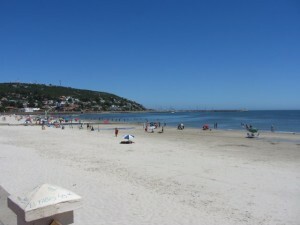 The people are incredibly friendly and laid back, the countryside picturesque and the beaches a dream. Get there, if you can! Vince is only jealous a goat has never looked at him that way… great pics and stories Shirl, sounds very laid back…. Bike looks in good nick, as do you both, although that beard Rixy???? Will we see you at Myer next xmas? Your trip is amazing! My husband and Love hearing your on 3AW on the weekends and we dream about getting on a bike sometime in the future and getting pleasure out of such and adventure. Good on you! 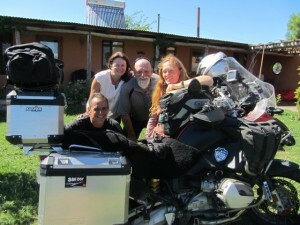 Hi Brian & Shirley, was on the Compass Expeditions trip south when I met you in Pucon at the start of your trip. Have heard you on Melbourne 774 a few times. The Colonia photo brings back memories of my visit at the end of my trip. I’d love to see more of Uruguay All the best, will keep tracking you. Chatted with you on the W2W ride in Sept 2011, one of the Tasmanian contingent. Really enjoying reading of your travels. 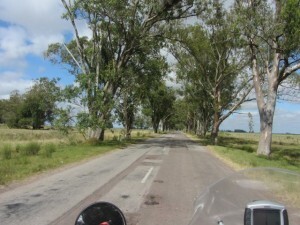 I was struck by the last picture in your Uruguay post – except for being on the wrong side, it looks like many a back road in NSW & Victoria! It is amazing with the gum trees everywhere. You think that you are at home. That river is so wide – about 220 km at the mouth. Have a look at the view from space and you can see the dirty river going out into the Atlantic. What a marvellous time you are having. Wish I was driving along too.